John Wall of the Washington Wizards celebrates during a game against the Atlanta Hawks at the Verizon Center in Washington in March. A month ago, a Hawks-Wizards matchup would have seemed like a breeze for Atlanta. With the No. 1 seed in the Eastern Conference, and fresh off a franchise-record 60-win season, the Hawks looked dominant, and the advanced metrics backed it up, ranking them as a top five team. The Wizards were mediocre by the eye-test and the statistics; the FiveThirtyEight projection was pessimistic on their playoff hopes, with a 60 percent chance they would lose in the first round. Fast-forward and the teams look more evenly matched. First, Atlanta lost Thabo Sefolosha, a feisty defender, to a broken leg after a bizarre run in with the New York Police Department. The Hawks struggled early in their series against the No. 8 seed Brooklyn Nets, who tied the series 2-2 before Atlanta took care of business. Meanwhile, the Wizards — who were underdogs in the first round according to our Real Plus-Minus-based forecast — easily dismantled the Toronto Raptors, sweeping them in four games by a 14-point margin per game. The latest RPM numbers still have Atlanta as the slightly better team, at +5.7 points per 100 possessions; the Wizards aren’t far beyond at +5.3. The FiveThirtyEight projection gives the Hawks a 55 percent chance of advancing to the conference finals — a Wizards win would barely qualify as an upset. Upset or not, the series features two squads who are similar in some respects. Both the Hawks and Wiz are great passing teams, ranking second and fifth in the league, respectively, in the percentage of their possessions ending in an assist. For Washington, though, that’s mostly driven by John Wall. Atlanta’s Spurs-like offense, constructed by Coach of the Year Mike Budenholzer, features constant passing and cutting involving all five players. But the teams are also very different in other ways. Take shooting, for instance. The Hawks launch a ton of threes — the fourth most in the league — and make them at an excellent rate (38 percent). Kyle Korver, who shot 49 percent from deep, had one of the best shooting seasons ever this year. But Washington is much less keen on the deep ball — they shoot the third fewest threes in the NBA. Instead, the Wiz rely on Wall to ignite fast breaks, which gets them about 16 points per game. 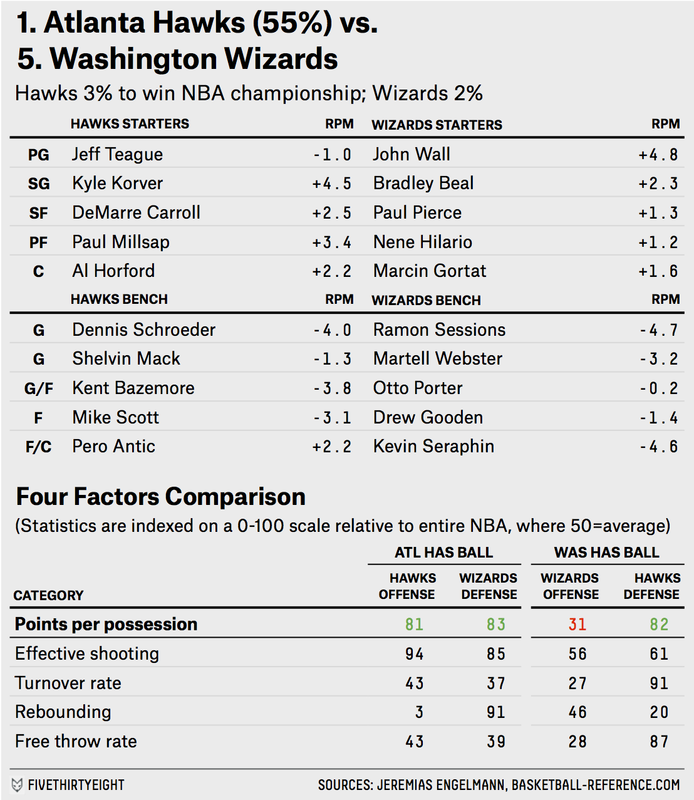 Washington is also a solid rebounding team, and they sport a better defensive RPM rating than the Hawks (+3.9 to +2.7). Atlanta is the favorite, but don’t be shocked if Washington plays lock-down defense into the Eastern Conference finals.